2016 marks a very important milestone in the world of auto racing. It marks the 100th anniversary of the Indianapolis 500. And it marks the 52nd consecutive year that it will air live on ABC. ABC’s expanded coverage of the 100th Indianapolis 500 presented by Firestone includes three cameras per car on 12 of the field’s 33 cars. There will also be four Ultra Hi Motion cameras positioned around the track that capture images 20 times slower than live action cameras. This allows viewers to see detail of the track, cars, and even pit road not commonly visible via live action cameras. There will also be aerial cameras mounted on a blimp, helicopter, and above pit road. The drivers whose cars will hold those onboard cameras are: pole sitter James Hinchcliffe, defending Indianapolis 500 winner Juan Pablo Montoya, 2015 Verizon Indycar Series Champion Scott Dixon, Simon Pagenaud, Josef Newgarden, Will Power, Graham Rahal, Tony Kanaan, Ryan Hunter- Reay, Marco Andretti, Takuma Sato, and Helio Castroneves. Castroneves has additional motivation this year. He will attempt this year to be only the fourth driver to win the race four times. A total of 287 microphones will be used to capture sound throughout the race. 26 of those microphones will be mounted on the field of 33 cars. 235 others will be mounted all the way around the track totaling 170,000 feet of fiber optic cable16 transmission points, and four uplinks. As if all of that isn’t enough, audiences will have also have the option of a second screen experience through a choice of live streaming video from the onboard cameras via ESPN3. ESPN3 will carry the feeds exclusively through WatchESPN. Allan Bestwick will anchor Sunday’s broadcast. He will be joined in the booth by analysts and former drivers Scott Goodyear and Eddie Cheever for additional commentary. Jon Beekhuis, Rick DeBruhl, and Dr. Jerry Punch will be in the pits with all of the latest news and interviews throughout the race. 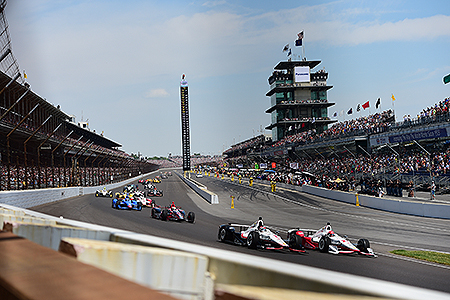 Lindsay Czarniak will anchor ABC’s pre-race broadcast live from IMS’ iconic pagoda. She will be joined by Marty Smith for additional commentary and insight.